An interview with Convivial Production. "Vines, branches and stems don't grow symmetrical to those they grow next to, they don't look around to see if they are "balanced".... They are each uniquely their own and I believe people are drawn to this whimsical, carefree, uncomplicated way of life"
For those who don't know, Amyann Kahler of Daylightmind Design was one of the first gals to work within the Convivial studio. She began as an intern in 2014 and eventually grew into her role as our main casting assistant. After two years on staff, she left to pursue her love for coffee and florals. 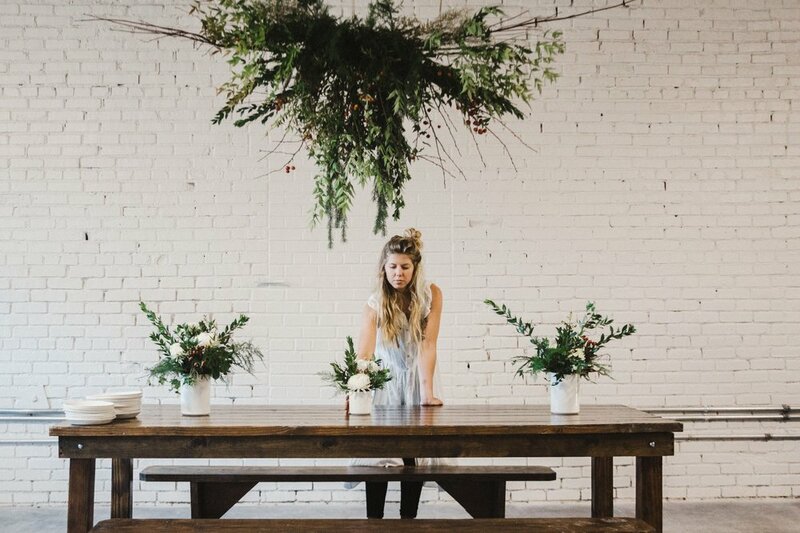 Catch her now at Monarch Coffee Shop during the week and on the weekend designing and curating florals for weddings. We've had the opportunity to collaborate with Amyann Kahler a handful of times this holiday season and wanted to take some time to highlight her floral design work through Daylightmind. 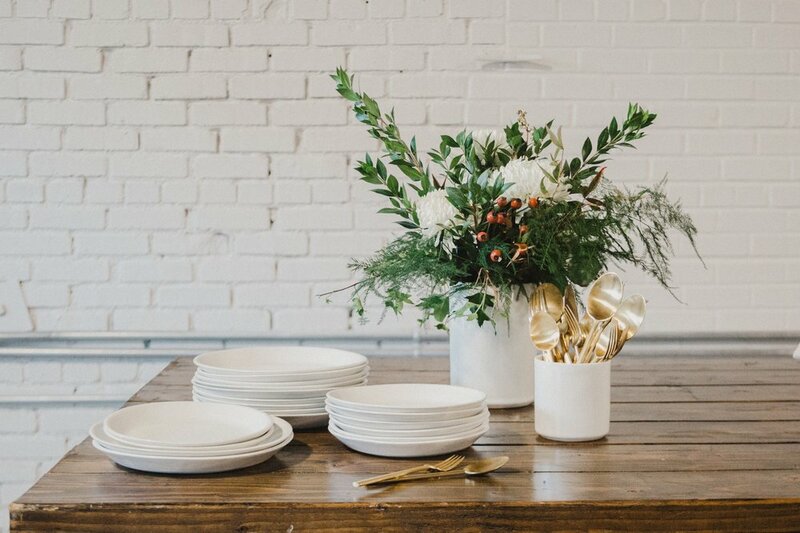 This editorial post features a recent interview with Amyann that digs into why she loves florals, how she approaches arrangements and some insights into the stems and blooms she used for our table arrangements this season. Hi, I am Amyann Kahler, owner & founder of Daylightmind Design. 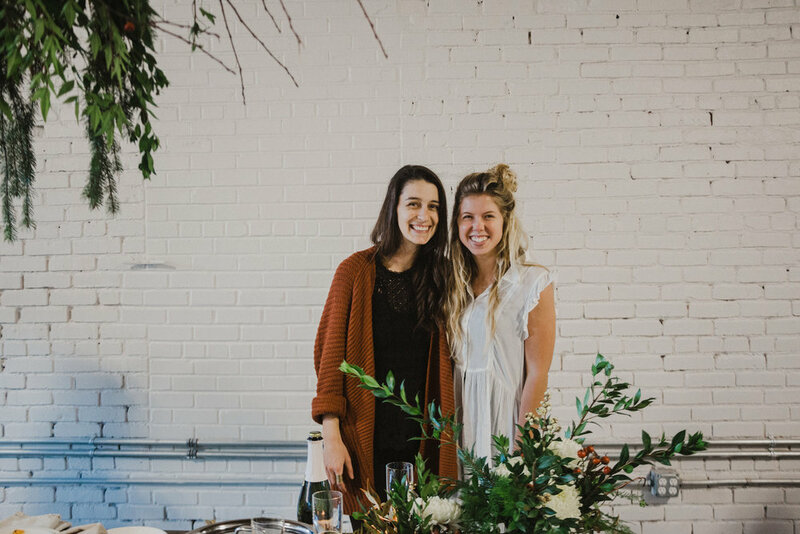 Daylightmind is a floral design company that I started 18 months ago, out of a need I saw for more modern floral design within the Kansas City area. My family has always had an appreciation for the outdoors and a love for all things that grow. Growing up, my father was always in the garden. He was either planting new seeds, watering fresh sprouts or pruning the overgrown. I attribute much of my desire to work with flowers and fresh greens to the time that I spent watching him curate and tend to his landscapes. When I was younger I didn't appreciate the forethought that it took to design a garden bed. My father however, saw the potential in what was not yet there. He could see the growth that was to come. He saw todays seeds as tomorrows full bloom. He would often say this Audrey Hepburn quote "To plant a tree is to believe in tomorrow." This notion has always inspired me. My father grew various outdoor plants and vegetables growing up, but he was known for his flowers. When friends and family came over they would often ask to walk through the garden together. They would have him explain all the flower types and the process he went through to grow them. I loved seeing how inspired people were by his handiwork and I learned so much from his ideas and process. I learned from him the value in investing in something just for the beauty of it and how, in turn, beauty can bring others joy. You reap no material value from planting flowers, rather all the wealth is found in its beauty - ones opportunity to appreciate its petals before they've fallen, to collect a bunch, bring them indoors and arrange them. My father valued flowers because they gave him and everyone that came to our home joy. As a florist now, I see this truth and it is one of the main reasons I love creating arrangements. I believe I am drawn to greens because there is a wildness in them that I find particularly intriguing. Nature has an ability to grow outside human ideals of symmetry. Vines, branches and stems don't grow symmetrical to those they're next to. They don't look around to see if they are "balanced" or "fitting in". Humans instictively do this, but plants do not. Each plant is uniquely their own and I'm drawn to this whimsical, carefree, uncomplicated way of life. When creating arrangements I often find myself trying to capture this - balancing curation and wildness to achieve a sense of beauty, joy and wonder. I once asked a dear friend if a particular arrangement looked "too wild," to which she responded, "I think flowers should be wild!" I tend to agree with her. The arrangements I made for the Minimal Vases were created in such a way to highlight the vase as well as the florals. The Minimal Vases are tall and wide. In order to achieve a balanced feel, I first added tall floral springs that would compliment the height of the vases. Then I added texture to fill out the arrangement and to add an overall whimsical feel. The white football Chrysanthemums were chosen to compliment the white of the vase, the red rose buds were picked to add visual variety and to add a pop of color that would contrast the green and white. HOW DO ARRANGEMENTS FIT INTO THE VISION OF SETTING THE SCENE FOR CONVIVIALITY? I love arranging centerpieces because they add a grace to any table and joy to any occasion. Florals add a finishing touch that express value - they affirm that the people who gathered are special. Flowers welcome people and they draw people towards the table to talk, to eat and to share with one another. Flowers have an ephemeral beauty that make people cheerful. This is conviviality. This inspires conviviality. WHERE DO YOU GET YOUR FLOWERS + FRESH GREENS FROM? I often incorporate foraged greens into my designs as well as flowers from my father's garden, however the bulk of my florals for events are sourced from a wholesaler north of the river called Baisch & Skinner. WHERE DO YOU SUGGEST POEPLE GET THEIR GREENS? If you live in Kansas City, you can find greens in many public places. I'd recommend Swope Park, Shawnee Mission Park or any of the trails that run through the city. If you don't live in KC, just look up local parks in your area and see what greens you can find. The trick is to visualize stems without all the other things growing around them. Find leaf structures that you like, snip them, and then put them into you favorite vase filled with room temperature water and simply enjoy!